It is not true that all poly tanks are the same. Rotathene® poly provides a much higher level of protection against the Sun than the required industry standard for poly tanks. This is how it received its name “SUPA UV”. Rotathene® SUPA UV provides superior protection for rotomoulded products by incorporating advanced additive technology well in advance of the standards specified. Traditionally a UV8 level of stabilisation has been considered the minimum required for good long term protection in Australia. This is the level specified in the Australian Tanks Standard, AS/NZS4766:2006. 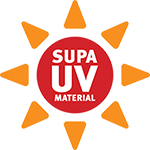 Where a UV8 level represents 8000 hours of accelerated UV testing in a machine before the plastic is deemed to have failed (below 50% of elongation), SUPA UV will withstand longer than 36,000 hours of intense UV testing and depending upon colour still retains up to 80% of elongation.